Do you ever pair your stripes with more stripes? It just feels like the right thing to do! I have had this body-con number for over three years now and it is still in heavy rotation. In the past I have always used this dress as the base and layered up over it, but on this day I decided to let the dress be the star. 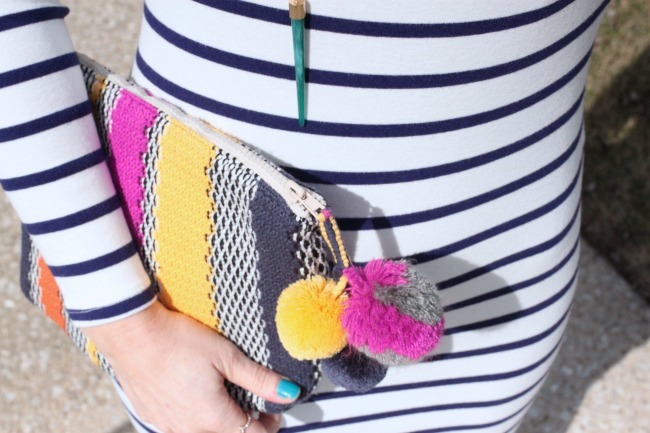 I grabbed an amazing stripe clutch (complete with adorable pom poms), gladiator sandals, and statement sunglasses and I was good to go for my day of errands and lunch out. What is your favorite print to pair with stripes? What do you think of this pairing?